The cost of the training is $150.00 ($200 if delivered at your facility) paid by the employer, referring agency or participants may pay on their own with cash or money order. Please follow your proper agency procedures when referring a youth/adult. The participant must be approved BEFORE attending the training. If there are questions regarding our agreement with your agency please contact Thomas Trotman to arrange payment and invoice procedure. Training is open to the public: individuals and employers. 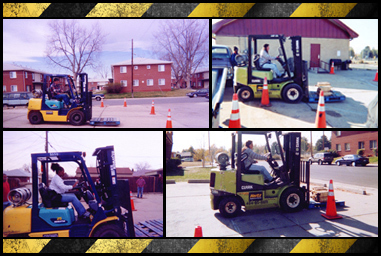 Part 1: Two hour training from 9am-11am consists of introduction to the forklift, safety video, paperwork, etc…..
Part 2: The second session will be from 11am – until. The second portion consists of the inspection, “hands-on” operation of the vehicle. Participants are REQUIRED to attend both sessions in order to receive certification. An OSHA Compliant Trainer conducts the training. Certification cards are valid for two calendar years. Participants 18 and over are eligible. A driver’s license is not required to attend the training (but may be required by an employer). To refer a participant, please email Thomas Trotman with: name, program record number, and the referring case manager fax number (or e-mail). You will receive an invoice within two business days after the referral is received. If there are any questions please feel free to contact us at 720-334-6424. The 10 hour Construction Safety Training can greatly increase participants chances of gaining meaningful employment. T-N-T offers over 36 “areas” of content in the Construction Safety curriculum such as: New Employee Orientation, Good Housekeeping, Personal Protective Equipment, Violence In the Workplace, etc…. Please see the attached list of all courses offered. Your agency can choose the components of the Intro to Construction Safety course that you want included in the training. Cost of the training = $600.00 per training session for large groups (maximum 15 participants per session). T-N-T Construction Training is happy to announce we are now an approved training provider for the Colorado Department of Transportation and will be offering CDOT’s Flagger Training and Certification Program at Northeast Church of Christ (5490 Crown Blvd. Denver CO 80239). Cost of training is $75.00. Click here for full details. Participants will learn the skills needed to prevent, recognize and provide basic care for injuries and sudden illnesses until advanced medical personnel arrive. This course covers first aid and adult CPR in an approach that complements adult learning styles, featuring hands-on practice and real life scenarios. Useful take-home course materials help you retain skills and serve as reference tools in an emergency. Meets OSHA First Aid/CPR Guidelines. Maximum 12 participants per session. Certification cards will be available upon completion of course. Adult CPR/First Aid coming soon….